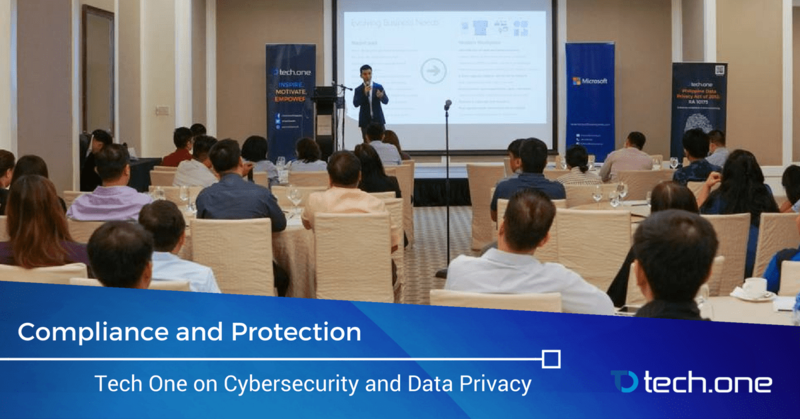 June 19, 2017 Discovery Primea, Makati — Tech One Global together with Microsoft initiated an event titled “Cybersecurity and Data Privacy.” With data quickly becoming the new oil of this generation, cybersecurity and data protection is now an utmost concern for any IT infrastructure. The event started with Tech One Global’s very own CEO, Lars Jeppesen, on his talk about digital transformation and how it disrupts every industry in terms of communication, collaboration, and business operations. With IT solutions and artificial intelligence becoming the new norm in the workplace, it’s becoming more and more important for companies to start adapting sooner. From his perspective as an innovator, speed is the defining factor of staying in the game: it’s either you ride with the flow or get left behind. After that, Ivy D. Patdu, Deputy Commissioner of National Privacy Commissioner, shared her thoughts on the Data Privacy Act of 2012 which rose to relevance due to a lot of data breaches in the cyberspace. With her experience, as both a lawyer and a long-time health privacy advocate, she enlightened the audience about the technical aspects of the law and its relation to the modern digital age. She emphasized that data breaches should be reported immediately for proper countermeasures and that every involved party in a data breach should be given the proper notification. Tim Vergel de Dios, Modern Workplace Specialist of Microsoft Philippines, continued the event with his talk on Secure Productive Enterprise. Given how the everyday work place is advancing in technology, there are still some risks especially in terms of overall security that come with it. He highlighted the capabilities of Windows 10 as an enterprise operating system. Mr. Vergel also gave insights on best practices that the average working man should follow to contribute into improving the overall cybersecurity posture of the whole company with the help Microsoft tools such as Office 365 and Skype for Business. The event’s last speech was from Tech One Global’s very own Infrastructure Services Manager, Vivek Sundararaj. He tackled the best cybersecurity practices that every company should follow in a mobile-first, cloud-first world. Venturing on topics like basic cybersecurity, employee mindset, and proper workflow management that are all essential as foundations of a strong and secure IT infrastructure. With more digital disruptions coming to every industry, securing data is becoming a top priority. Data will continue to jump in value and the security needed to preserve it will increase tenfold. Tech One Global is ready to give its full support in pushing an age where every industry is digitally secured.